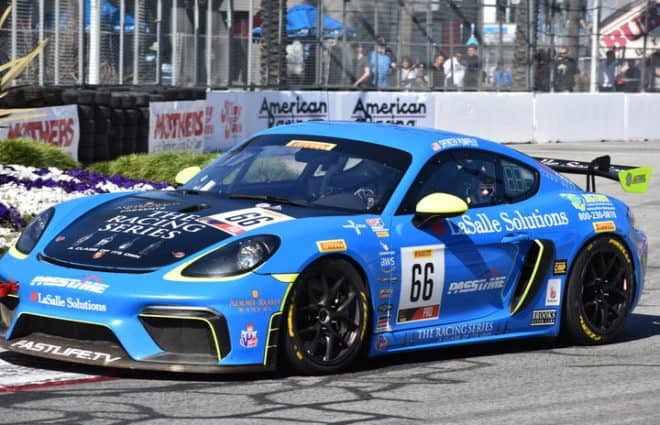 On Saturday morning (April 13), The Racers Group’s Spencer Pumpelly won the pole for Sunday’s 50-minute Pirelli GT4 America Sprint race in Long Beach. Pumpelly’s lap of 82.462 mph is the fastest lap of the entire weekend for GT4 equipment. It is also the only Pirelli GT4 America Sprint lap of the weekend completed in under 86 seconds. The session was a back-and-forth between Pumpelly and both of the Team Panoz Racing Panoz Avezzano GT4s. Pumpelly’s lap was two-tenths of a second faster than Ian James in the No. 50 Panoz. MarcoPolo Motorsports’ Nicolai Elghanayan qualified third in class with the sole KTM X-Bow GT4 in the field. Shane Lewis was fourth in the best of the Robinson Racing Chevrolet Camaro GT4.Rs, while Michael Cooper was fifth in his McLaren. The Am class saw the second Panoz of Matthew Keegan top the charts with a lap at 82.109 mph, good for third overall. Keegan’s lap was just over a tenth of a second faster than Drew Staveley in his Ford Mustang GT4. Jarret Andretti, fresh off announcing his Indy Lights debut on Friday, will start third in class, followed by Bob Michaelian in the SIN R1 GT4 for Racers Edge Motorsports. Tony Gaples will start fifth in class in the second Blackdog Speed Shop McLaren. 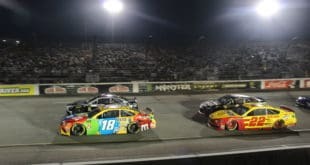 One car out of the 21 entered did not set a time during the session. That was Flying Lizard Motorsports’ Michael Dinan. During the short practice session that preceded qualifying, Dinan made slight contact with the wall that damaged his Porsche. As a result, the team elected to sit out the session to make repairs. Dinan will have to start at the rear of the field on Sunday. Round No. 3 of the Pirelli GT4 America Sprint championship is scheduled to begin at 1 p.m. EDT Sunday (10 a.m. in Long Beach). The race will be streamed live at GT4-America.com.